You can use ChurchFinder.com to create your “shortlist” of churches to visit, and then make plans to start visiting the churches. After you visit each church, be sure to write in your journal. Your journal can be a notebook or paper journal that you carry with you, or you can use the on-line journal provided on your ChurchFinder.com Dashboard. One important thing to observe when you visit is how you are received and welcomed - but don't completely judge the church based on this alone. Do you feel like you would be welcomed right into the family, or do you get the sense that you are viewed as an “outsider” to a group of people who have known each other all their lives? If you feel you are treated like an "outsider", it is OK to be a little cautious but be careful not to be to offended. The people you encountered probably have been there awhile, have made some good friends already (which is a good sign of a healthy church). But at the same time they probably don’t realize they are treating visitors that way. This is especially true in larger churches, so they can certainly seem intimidating at first. When you visit, ask if they have "small groups", Sunday school classes, or other groups that will make it easier to meet people and be part of the community. Pay attention to the pastor and his sermon or message. Does he challenge the members and encourage them in their Christian walk? Did he or she teach from the Bible? Were you challenged by the message? Maybe his message made you uncomfortable - that might not be a bad thing. Ask yourself why you were uncomfortable, and be honest with yourself. If you were uncomfortable because the pastor's message challenged you, then that might be a good thing if you want grow in your Christian faith and improve your life. Write some notes about the message - did you learn something you can apply to your life? You may need to visit a few times to get a good feel for the pastor and his messages. Did the sermon, worship service, and atmosphere seem like a a vibrant church family? Or did you get more of a “social club” feeling? A good church family should have a social aspect - opportunities for you to meet others and make friends. A good church should be a place where you feel you can grow in your Christian faith and meet others who are growing as well. Is the church active in outreach and service to the community? Do they support missionaries, and have short-term missions trips? Ask yourself after the service if you think the church has a more “inward focus” (e.g., only focused on all of the activities at the church) or is there a good balance of social activities and also an “outward focus” on community outreach and world-wide missions. There are several other things you should consider when visiting your shortlist of churches. 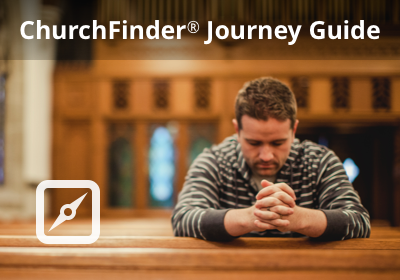 In the next few sessions of the ChurchFinder.com Journey Guide, we will continue to explore different sizes and types of churches, church denominations, Christian teaching, and more things to consider as you find the church that’s right for you.